Why Take Liquid Extracts Over Capsules or Tablets? Medical studies have shown that liquid extracts have faster absorption rates; higher optimization rates and is more easily digestible. Liquids may have a big advantage over pills when it comes to swallowing. Most people, especially the elderly and young children, tend to have more difficulty swallowing some pills. Generally, supplements in liquid form are much more readily broken down and absorbed. Additionally, it has been shown that liquids are more completely and quickly absorbed than most capsules and pills. In fact, the Physician's Desk Reference states that 85-90% of nutrients in liquid supplements are absorbed in 22 to 30 seconds. Compare this to hours it takes for the nutrients in pills to be absorbed by the body. Moreover, it has been demonstrated that only 10%-20% of the nutrients in pills actually are absorbed. 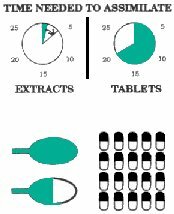 The National Advisory Board state that 100 mg consumed in tablet form translates into a concentration of only 8.3 mg or 8.3% in the blood. A pilot study evaluating the bioavailability and absorption rates of two vitamin B-12 preparations in normal human subjects, demonstrated that absorption rate was significantly increased when dosing was in a liquid rather than solid form. Liquid medicine is the preferred method of delivery in hospitals from emergency rooms to patient care because of the immediate benefits for the patient. While there is nothing wrong with a capsule or tablet, there are proven findings that show a liquid extract to be more powerful, beneficial and fast acting. 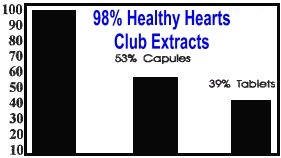 We all want the best, especially when it comes to our health and this is why at Healthy Hearts Club we have invested in the best format for our Heart & Body Extract-Liquid. So What Are the Benefits To A Liquid Extract? One of the primary benefits of using liquid herbal extracts is that they do not require digestion. You don’t need to extract what is medicinal from the plant cellulose before it can be absorbed because it’s already been done for you. The body does not need to break down a liquid extract, allowing more of the medicinal properties to be absorbed into the system. This makes liquid extract much more powerful than a capsule or tablet. When using capsules or tablets, the body must first extract or break down the medicinal properties of the herb to put them in liquid form in the stomach. Liquid extracts take 1-4 minutes to assimilate. Capsules or tablets (pills) can take from 20-30 minutes just to break down, before the body can even start to assimilate them. Studies have shown that the body uses 98% of our liquid extracts. The body only utilizes approximately 39-53% of capsules or tablets. Guess where the remainder ends up? You guessed it! Flushed down the toilet along with your hard earned dollar. In order for any nutrient to reach the cells of the body, the nutrient must first be suspended in a solution. Or in other words it must be liquid. As a rule, the nearer a herbal preparation approaches the liquid form, the quicker and more completely it will assimilate and take effect in your body. And let’s face it, we are a society of instant gratification. Wouldn’t you want your first choice to be the option to provide the most benefit in the least amount of time? If you answered “of course!” then Liquid Extracts are the Best Choice! "Experience The Liquid Extract Difference"
To learn more about our Heart and Body Extract and how it can help you with your own Healthy Heart, click here. Extracts can be assimilated into the body in 1 to 4 minutes. Capsules or tablets (pills) can take from 20 to 30 minutes just to break down, before the body can even start to assimilate them. EXTRACTS ARE EVEN MORE POWERFUL! of 1½ teaspoons of our herbal extract. in your own pursuit of good health!